Sir Henry Holland, 1st Baronet FRS, DCL (27 October 1788 – 27 October 1873), was a British physician and travel writer. 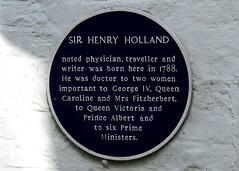 Sir Henry Holland noted physician, traveller and writer was born here in 1788. He was doctor to two women important to George IV, Queen Caroline and Mrs Fitzherbert, to Queen Victoria and Prince Albert and to six Prime Ministers.